Become the master of your prehistoric domain with these pointers. 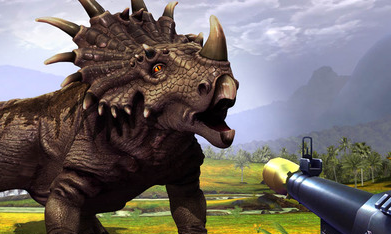 Dino Hunter: Deadly Shores is a unique title in that you're tasked with hunting dinosaurs to bag the highest score possible on each level. Dinosaurs are obviously a lot more trouble than your typical opponent, so we compiled some tips and tricks in an effort to help you play your best few rounds. Become a master hunter and take on even the most ferocious of prehistoric predators using these tips as ammunition! Every shot is worth money. It may not seem like it at first, but every bullet you dispatch is worth bonus moolah that won't be paid out unless you use your equipment correctly. So take aim and try to shoot for the heart or lungs if you can, which net you more cash than even a headshot. While it's tempting to go the Call of Duty route, lung shots will earn you a cool $25, and taking the heart is worth $50, which is a hefty wad of cash when it comes to upgrades. Stick to your rifles and scopes to discern exactly where it is you need to shoot and you'll be rolling in the dough in no time. If you don't plan on parting with a lot of real-world cash in the game to progress, it will be imperative for you to save every bit of gold you receive for a better weapon later on. Premium weapons will become your lifeblood in later levels, so do what you can to ensure you have enough capital to purchase them. In some missions, the exact same species of dinosaur can reappear, but will carry the label of "young," or "mature." You can bag these same species for varying score amounts, but be advised that some will inevitably be more difficult to kill than others. Use caution when approaching, as they may come after you instead of remaining docile, which could obviously ruin your whole hunting excursion! Beginners will find that the starter equipment is viable right up until the hunts start getting more serious. And at that time, you're going to want to place emphasis on upgrading your starter guns first. Purchase stabilization, scopes and additional equipment to bolster the guns you're outfitted with first, and then you'll be at an advantage when the later levels arrive and you find yourself without proper gear. Download Dino Hunter: Deadly Shores for iPhone, iPad and Android!